A Ridgefield native, Olinto P. Carboni was born in 1909, a son of Benvenuto and Assunta Carboni (Benvenuto is already profiled in Who Was Who). He had four brothers, Adrian (“Ade”), Octavius (“Tabby”), Navio (“Pete”), and Reno (“Renz”), and a sister, Mary Carboni Michell, who all became well known in town. As a boy he got his first job carrying water to thirsty workers building Branchville Road into one of the region’s first paved highways. He also caddied at Silver Spring Country Club, when carrying two bags for 18 holes would earn $2. “I had to give the money to my mother and she let me keep 10 cents,” he recalled in 2004. While he was attending Ridgefield High School, he worked before and after school doing bookkeeping and deliveries for “Jimmy Joe” Joseph’s store at the intersection of Main Street and North Salem Road (“Joe’s Corner”). He was a star athlete at RHS, captaining the baseball and basketball teams and playing football. After he graduated in 1927, he played for Ridgefield’s baseball and football Spartans and its basketball team, The Millionaires, in the region’s popular inter-town sports leagues. For many years he served as a high school basketball referee, with legs strong enough to work two games in one night. As “Battling Bones,” Carboni was also a successful boxer, fighting in his late teens as a featherweight in bouts in throughout the area. He never lost a fight. He, his father and his brothers all conspired to keep his boxing a secret from his mother, who opposed her son’s participation in the sport. Carboni and Dot Bennett eloped in 1931. Both loved to dance and were famous throughout their lives for their prowess on the dance floor. When they were courting, Lynce would take her dancing at Peach Lake, in Danbury, Bridgeport and even New York in his Model A Ford. They marked their 65th wedding anniversary in 1996, the year she died. “He was a hard worker,” said Chip Bliss. “He single-handedly built the foundation on his house — dug it out. He had it all done and a terrible rainstorm caved in two walls and he had to rebuild it. That just shows the persistence he had.” That house on Pound Street was his home for some six decades, but in his last years, he lived on Prospect Street. Carboni served in the Navy during World War II aboard the U.S.S. Astoria, a light cruiser, in the Pacific. He thought his knowledge of pumps would land him a job in damage control, but he could also type and was made yeoman to the executive officer, the ship’s second-in-command. He was on the Astoria in the China Sea in December 1944 when it survived a huge typhoon that capsized and sank three U.S. Navy destroyers. “They ran out of fuel and were at the mercy of the sea,” he reminisced in 2000. His ship was the target of kamikaze pilots during the invasion of Okinawa, and he recalled one crashing so close it shook the entire ship. He was on the Astoria in Tokyo Harbor when the Japanese surrender was signed aboard the U.S.S. Missouri. After the war Carboni joined John Tulipani in forming a plumbing business. In 1959, he did a plumbing job at the Board of Education offices in what is now St. Stephen’s South Hall, and his work caught the eye of school administrators. He was offered the job as the only “maintenance mechanic” for the Ridgefield Public Schools, which then had only two buildings, Veterans Park and the old high school. When he retired in 1976, the district had grown to eight school buildings and he headed a crew of five men who kept them all in repair. But he didn’t really retire that year. He continued to work as the schools’ “courier,” ferrying documents and other deliveries among the various schools and administrative headquarters. He continued courier services until finally retiring in 2000, nearly 92 years old. And he continued driving until he was 95. Over the years, Carboni encouraged and inspired many young athletes and coached Little League baseball for many seasons. He was a life member of the Ridgefield Volunteer Fire Department and the Italian American Mutual Aid Society — he continued to serve at the club’s monthly men’s and women’s dinner nights into his 90s. 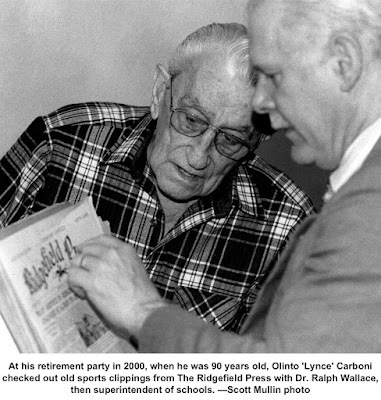 He was also a founding member of the Ridgefield Old Timers Association and was honored by the Danbury Old Timers. Lynce Carboni died in 2006 at the age of 97 and is buried beside his wife in the Bennett family plot in Fairview Cemetery.